Plantéria™ CF is natural organic compounds derived from citrus fruits that contains a group of active ingredients of Bioflavonoids, Polyphenols, Citric acid and Ascorbic acid, and is mainly used as a multi-hurdle antioxidant and antimicrobial in a variety of foods. The Recommended dosage is 0.25-1 g/kg The applied method and extract dosage of Plantéria™ CF depends on the application for which it is intended. Please contact us for specific information. 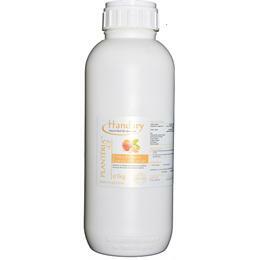 Approximate values for nutrition labelling per 100 g.
Plantéria™ CF is available in 1 kg/bottle. Packaging is available in other quantities. Plantéria™ CF is described as Citrus extract by US FDA and is approved as GRAS, for use as an antimicrobial and preservative in all in the majority of foods. All individual components of the ingredient have FDA GRAS status, compliant with proposed rule 21 CFR 170.36. Plantéria™ CF composite are GRAS ingredients of Citrus extract (CAS No. 8008-57-9 / 8008-31-9 / 8008-57-9), Glycerin (CAS No.56 81 5), Fructooligosaccarides (CAS No. 308066-66-2), L-lactic acid (CAS No. 79-33-4), and Citric acid (CAS No. 77-92-9). *The applied method and extract dosage of Plantéria™ CF depends on the application for which it is intended. Please contact us for specific information.